Anna Fox – ‘Fortunes are being made that are in line with the dreams of avarice’. It is 1987 in the City of London. Photographer Anna Fox is in a cafe armed with a Plaubel Makina 6 x 7 medium format film camera with a wide-angle lens and flash. On a commission from Camerawork Gallery and The Museum of London, Fox has been documenting London office life. Today she is photographing men eating breakfast. A suited salesman, sallow skinned with dead eyes fixed on his next sale, shovels in a lump of bacon, thick with ketchup. Fox’s flash isolates him from the dimly lit men surrounding him – the colours are rich, the shadows dense. 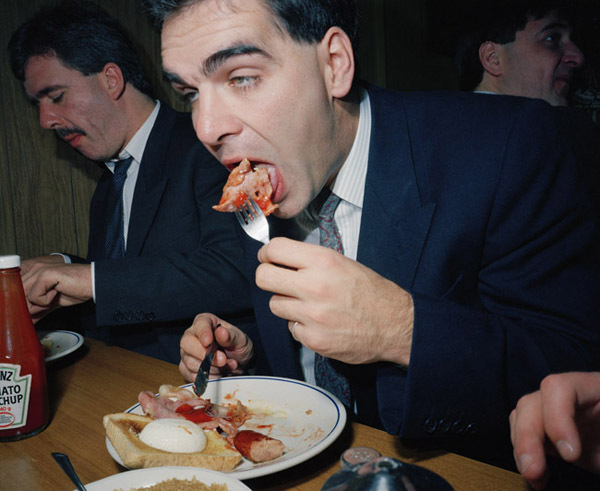 Were we to feel charitable we might pity him the indignity, his forkful of bacon caught mid flight – but no, his image serves a greater purpose, this is a photograph all about greed. If we are in any doubt we need look no further than Fox’s accompanying text ‘Fortunes are being made that are in line with the dreams of avarice’. Fox’s commission concluded in a series of 35 colour prints, first exhibited at Camerawork in 1987, and the photobook Work Stations depicting the rivalry and struggle at the heart of office life. Senil Gupta in his accompanying text describes this conflict as ‘total war, where men do battle and woman are relegated to supporting roles’. This is a war fuelled by an ideology of greed in which everything can be bought and everything can be sold. In 1987 the Conservatives won their third consecutive election victory, eager to continue their free-for-all privatisation of public industries and services. Between them and successive governments this has included British Aerospace, Cable & Wireless, Jaguar, British Telecom, Britoil, British Gas, British Steel, British Petroleum, Rolls Royce, British Airways, British Coal, Powergen, National Power, British Rail and the Royal Mail. Today in 2015 we live with the legacy of that economy of greed as our education system and the National Health Service are hived off to the highest bidders.